Temporary workers say they are losing thousands of pounds in wages because they are being exploited by so-called umbrella companies. Workers claim these companies act as middlemen between contractors and employees, and are forcing staff to pay extra tax and administration fees. An estimated 430,000 people in the UK are paid through such firms. The Freelancer and Contractor Services Association said umbrella firms were an efficient way to pay temporary workers. MPs say they will examine whether workers have been exploited, after an investigation by BBC Yorkshire heard from workers who complained about the practice. Gerry Byrd, a construction worker from Leeds, said umbrella firms exploited workers who once had secure jobs. He said: "My pay slip now looks like a shopping catalogue, there are so many procedures and deductions. "Builders who once had steady full-time jobs are being told they have to sign up to these deals in order to get work through agencies. The whole practice is now rife in the industry." A supply teacher from Bradford, who agreed to speak anonymously, said she lost out on £104 a week in deductions made by an umbrella company. "I think these companies are pirates making money out my hard work. This is money I could have used to put food on the table for my family and what's more, they're just taking large amounts of money out of the education system." 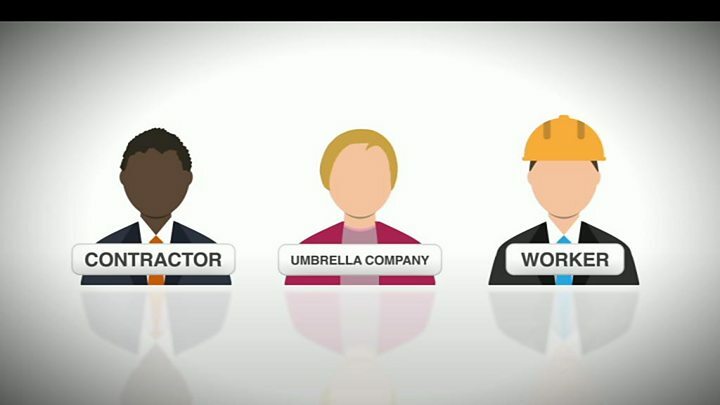 An umbrella company is a business that acts as a third party between a contractor and an employee. The contractor outsources its payroll functions to the umbrella company, which handles the pay of the employee and makes any necessary tax deductions. These sorts of arrangements are being commonly used in sectors such as the construction and hospitality industries where large numbers of temporary workers are required to work on short-term projects. Workers claim that umbrella firms were deducting holiday pay from their wages, and illegally forcing them to pay both the employer's and their own national insurance contributions. The use of umbrella companies is completely legal. However, a spokesperson for Her Majesty's Revenue and Customs (HMRC) said: "It is illegal for workers to pay the national insurance contributions of employers and HMRC cracks down on any abuse of PAYE rules." Jolyon Maugham QC, an employment tax expert, said many umbrella companies were simply an attempt to circumvent the law. He said: "What people don't realise is that these companies are simply mechanisms whereby workers are stripped of rights they would otherwise have and the taxman loses out on tax that would otherwise be collected." However, others argue that umbrella companies are an efficient way to pay contractors and make it easier for temporary workers employed on different projects or jobs to look after their tax affairs. "We really would like to expose bad practice so we are not all tarnished with the same brush," said Julia Kermode, chief executive of the Freelancer and Contractor Services Association, a trade body representing umbrella firms. "Working through an umbrella company means workers don't have to worry about doing their own tax administration and it makes life simpler for some people, but at the same time we recognise that not every umbrella firm is working in the best interests of their clients." MPs on the Business, Energy and Industrial Strategy Committee have launched an investigation into the issue of insecure work and employee rights, called The Future World Of Work. 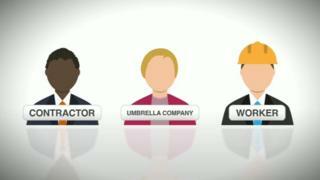 Image caption Iain Wright MP says the Business Committee in Parliament will investigate whether workers of umbrella companies have been ripped off. Labour MP Iain Wright, who chairs the committee, said umbrella companies had many questions to answer following the investigation by BBC Yorkshire. He said: "It's certainly clear that umbrella companies can be a big con for some workers. "I want to see someone come before the select committee and justify why umbrella companies are a good deal for the worker because at the moment I can't see that there's any advantage for the worker whatsoever." Reporting by Sophia Ewen, Sean Stowell and David Rhodes. Who do I really work for?